We’re just back from a nine-day family vacation. Nine days. And my teenagers actually wanted to go. While the trip started out a bit rocky. Rocky, as in I vomited all the way from the TSA line at National Airport through a layover in Milwaukee and onward to San Francisco. Rocky, as in the flight attendant on the second flight asked Andrew if I was a nervous flyer. He said, “No, she’s just sick.” Bet that made her day. And rocky, as in I missed the first 36 hours of our San Fran visit. But Andrew and the boys kept on ticking. I had a great and comfortable place to rest (go VRBO!) and they saw the Golden Gate Bridge and Sausalito (which they fondly call Sausagelito). And they saw the SF Museum of Modern Art. And rode cable cars. And such. I totally rallied for Alcatraz. It was so interesting and a beautiful day. We were so happy to be together. It was, for me, the start of a wonderful vacation. Did you know that there are still three Alcatraz prisoners alive? All are still in prison somewhere. Andrew is really into the show Alcatraz. I think it’s just creepy. But, I digress. Dinner that night? So fun. We went to Range. And yes, my sons were the only non-adults there. But no one seemed to mind. They’re as tall as the adults, anyway. And they know their way around a nice restaurant. It was all good. The next 4 days were incredible. Monterey. Yosemite. (We stayed in a Caboose and had fabulous Cajun food. Not kidding.) Sequoia. And Death Valley. 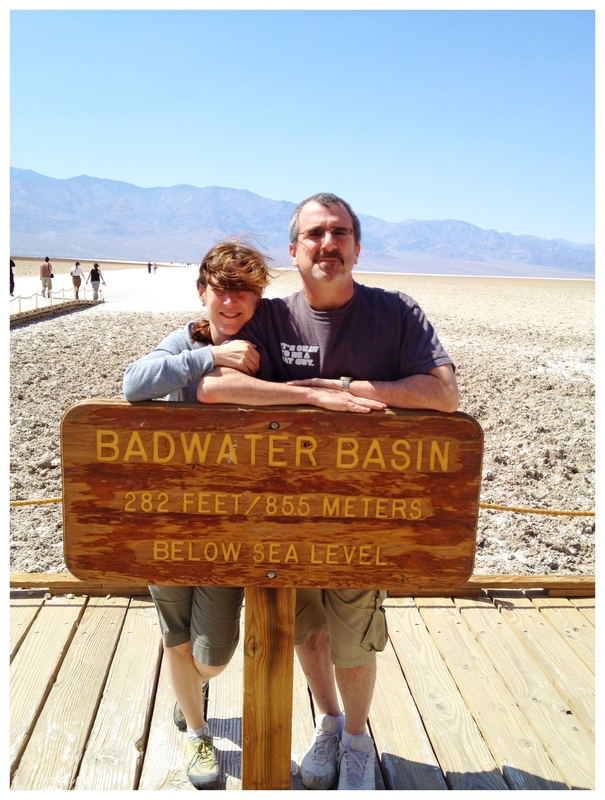 Very fun “resort” in Death Valley. We met the nicest people there. And honestly, I think that I slept better there than any other night. It was just so peaceful and we were so darn happy. After dinner, there was nothing to do. I mean nothing. No Internet. No TV. No cell service. We bought a 40 at the convenience store (for the adults, obviously) and some snacks for all. And we played poker. All of us in one room, laughing and playing cards. So fun. And the next morning, we headed into the park and saw the sites. We hiked. We took pix. (Okay, that was me.) 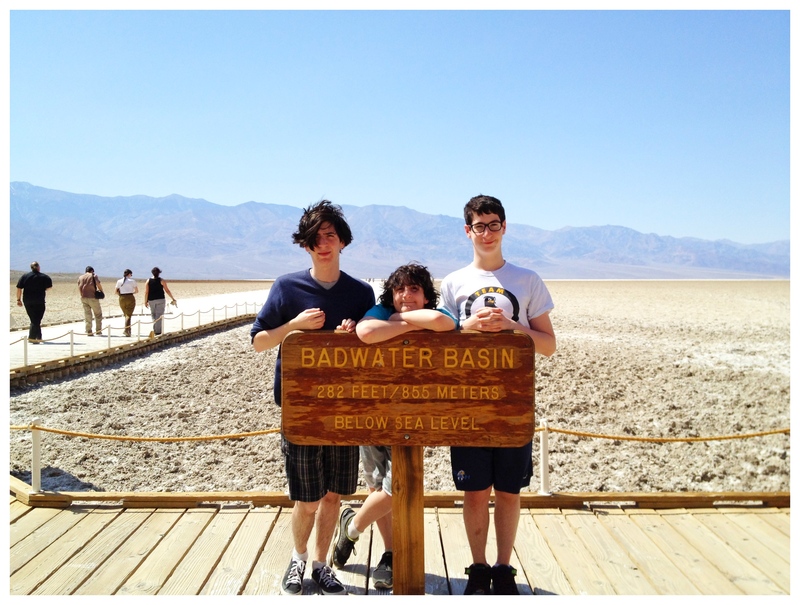 and we went to the lowest place in North America. After a full and exhausting day, we headed east to Las Vegas. There are a million details I left out. Like the Artichoke Capital of the World. Like the funny Mexican restaurant in Laughlin. Or Laughlin, in general. I can’t express how happy I am that we had a week of laughs. A week of talking. A week of experiencing. A week I’ll never forget. My boys are growing up so fast. Davis will be applying to colleges soon. And as of next fall, they’ll all be in high school. No more middle school. No more elementary school. No more preschool. < If you’re wondering where we are. I loved this post. So nice of you to share you amazing vacation adventures with us. And, uhm…so good to have you back! Thanks, Candace. Glad to be back, but I sure enjoyed the time off!